Roll out one of the pie crusts, and use a knife to cut it into fourths. Press one of the pie crust pieces into one of the teardrop muffin tins, and then trim the edges so that an 1/8-inch of the crust borders the top of the tin. Press the edges down and score with a fork if desired. Repeat with remaining tins and the remaining pie crust until 8 pie crusts are prepared. Bake crusts in the oven for 5 minutes. Then remove. Meanwhile, heat oil in a large skillet over medium-high heat. Add garlic and onions and cook, stirring occasionally, until onions are soft. Remove from heat and transfer mixture to a large mixing bowl. Add the fresh spinach, eggs, cheese, salt, and pepper, and stir until combined. Spoon the mixture into the pre-baked pie crusts until they are filled. Bake in preheated oven until eggs have set and the top is slightly browned, about 20-25 minutes. Remove and let cool for 10 minutes before serving. Serve with the corners placed together, forming a four-leaf clover shape. 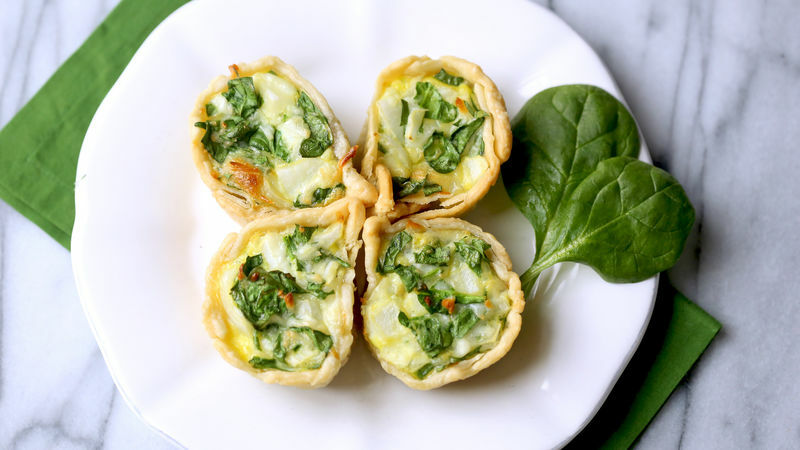 These mini spinach pies also pack a bit o' luck! This St. Patty’s Day, you can wear your green…and eat it too!!! And you can clearly see, these wee little spinach pies are not only packed with lots of delicious fresh spinach --they are shaped into charming little four-leaf clovers! All you need is an aluminum foil muffin pan to make it happen, and these lucky little pies will be the talk o’ your brunch. Here’s the how to make the deliciousness happen! First, it’s time to clover-ify two 6-cup aluminum foil baking pans. Pinch together one side of the four corner cups to form each into a teardrop shape. Then take some Pillsbury pie crust, divide each crust into quarters. And then press each quarter down into the teardrop baking cups. Pre-bake each pan for about 5 minutes. Meanwhile, prepare your spinach pie filling. Then once the pie crusts are out, fill each crust to the top, but not overflowing. Bake again for 20-25 minutes or until the pies are set. Serve with the corners nestled together to form four leaf clovers. And have a very happy St. Patrick’s Day!